40 frame Tangential Extractor. This type of extractor is very efficient. The extractor turns for only five minutes per cycle. A radial extractor by contrast, uses around a 15 minute cycle. The honey leaves the extractor and flows into a clarifier that is below the floor. 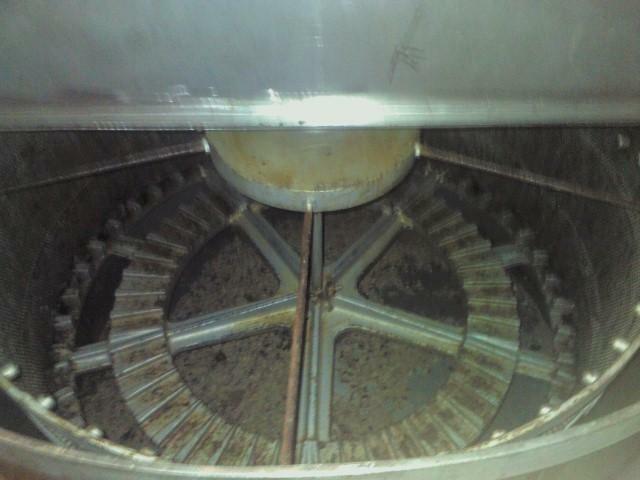 From the clarifier the honey is pumped through a bag filter, then into the honey bulk tank. The bulk tank is piped to an E-Z Fill automatic bottler. This bottler fills a wide variety of bottle sizes. The E-Z fill can be set to fill any size bottle, filling the bottle precisely to the correct weight. 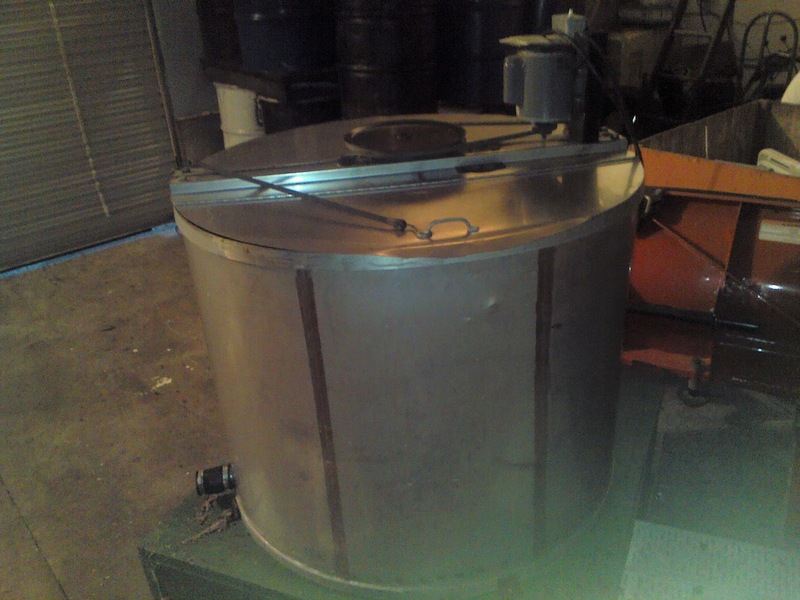 The other tank to the rear of the pic is a wax melter. We now have moisture boards in stock. Sometime in the next 7 to 10 days, is a good time to treat with oxalic acid. Pick a time of day when it is around 40 degrees at the time of treatment. The new bee lab is having a grand opening. Please come and tour the facility. In late October commercial beekeepers are finishing their work also. Many of them are preparing hives for shipment to warmer climates. Hives are moved to a central location. They are then loaded on to trucks, strapped down and covered with a net. A flat bed semi can haul 800 palletized single deep hives. Not much happening in the hives at the moment. Beekeepers are waiting for a little cooler weather to do Oxalic Acid treatments. Looks like that is about a week away. To be effective, the temperatures should be around 40 - 42 degrees out. The day can warm up later, but at time of treatment it should be around 40 degrees. At this temperature the bees will be in a harder cluster so the dribble and vaporizer methods will catch all the bees in one concentrated area. If it is warmer than 40 degrees, the bee cluster is looser and bees are more spread out. The treatment for the dribble method in warmer temperatures, is less effective. Some beekeepers are still scrambling to get more feed into the hives before the temperatures cool down. The bees are still taking syrup. Too soon for covering hives but that time is coming soon. A waiting game for most of us at the moment. But in the next 30 days we should all be done with our hives until February. We are now back to our regular hours after being on vacation. If feeding still needs to be done, feed now with 2:1 sugar water or ProSweet, don't wait to feed. The weather is still warm enough for feeding and beekeepers need to take advantage of that before any permanent cool down moves in. 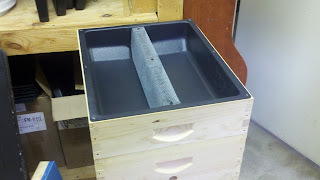 Winter covers and moisture boards are the hot item with beekeepers at the moment. Still too early to cover the hives but with cold weather on the horizon, beekeepers are getting their supplies in order. 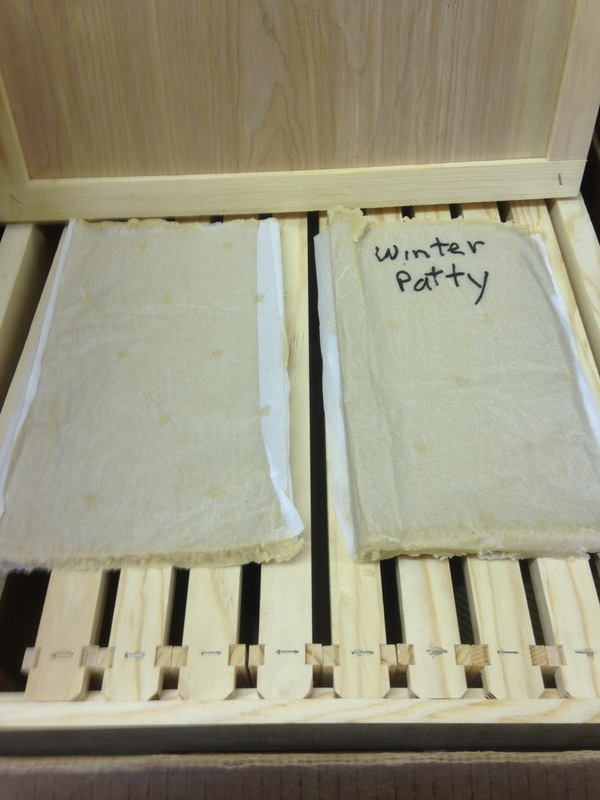 We are still waiting on receiving winter patty supplies. hopefully we should have them soon. 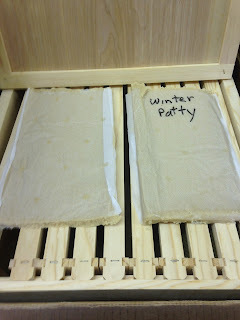 Packaging of winter patties may be different than in years past. Nothing major, I will make a video if there is any big changes. Still too warm for Oxalic acid treatments but that will be coming soon, so keep that in the back of your mind. Entrance reducers should be on, mice are lurking in the tall grass, so let's keep the mice out before they think they have a new Holiday Inn. Where we are at on the bee front for early October. Welcome to October. Cooler weather is starting to creep in, and soon it will be the norm. Everyone should have treated their hives with mite treatments by now. Feeding has been going on and should start slowing down as it gets cooler. I have had a few customers discovering that they suddenly have very high mite counts in their colonies. This can come from a couple of factors. 1. The colonies had high mite counts in the brood cells when they initially treated and the desired mite mortality did not occur. 2. That their colonies were involved in robbing out a colony in thier immediate area from a beekeeper that did not treat for mites. The mites hopped on the robbing bees and viola, high mite infestation. A treatment of Oxalic Acid at the right time should be able to take down the high mite load and hopefully keep the bees healthy. Entrance reducers should be in place now. With the cooler weather, mice will start to want to move in for the winter. Entrance reducers can be put in with the larger opening. Winter covers and Oxalic Acid treatments are on the horizon, but still about three weeks away, unless there is a drastic weather change. Like a foot of snow. Last of the good feeding weather? This next four or five days may be the last 70's we will see. Perfect feeding weather. End of next week has highs in the low 50's. As the temperatures cool, feeding slows down. The bees don't like cold syrup. So take advantage of the weather and get the feeding done. By this time, all colonies should have been treated for mites. The top box on a hive should be pretty much full of honey. Oh, by the way, happy October. These are the best vaporizers on the market today and will last a long time. A commercial beekeeper I know in the south metro had his bee yards is in a low area. With all the rain recently his hives all of a sudden, were going under water. His hives are palletized with four hives to a pallet. All of his hives are two deep hives. The water came up so fast that he could not use his bobcat to get the hives. He feared that the bobcat would get stuck and that would be getting submerged also. So getting the hives came to be the hard way. He had to lift every box off the pallet himself and move them to high ground. Remember they are all heavy with winter stores. 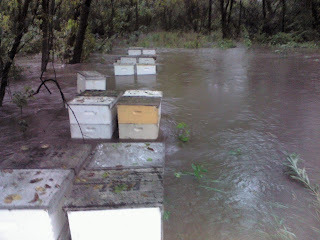 The hives in the foreground the water is up to the pallets. The hives in the distance are under water with only the top box above water. All the bees had moved to the upper box. Safe and sound in a new location. All of the hives are alive. This is where I am at with my bees. I have pulled all my honey. It is sitting in my honey house with a dehumidifier running. The dehumidifier is keeping the room in the 80's. The plan is to extract all my honey this coming week. The dehumidifier should get any of the honey that was a bit high in moisture content, down to Grade A status by the time I extract. All of my hives have been treated for mites. Now I am into mass feeding mode. I did have one yard perform poorly on the honey collection and all of the hives are being fed hard with Pro-Sweet as shown in my previous post video. That yard all of the hives needed to be fed. Each of the hives only had about four frames of honey in the top box. My two rounds of feeding should have given each hive about seventy two pounds of Pro-Sweet. That should be enough to fill approximately eight deep frames. So those hives should be good. My other two yards had good honey crops and most of the hives are very heavy with honey stores. I have one hive in each yard that needs to be fed once. Any hives that need feeding has to be fed now. The later a hive is fed, the longer brood will be present. The longer brood is present, the more opportunity for mites to reproduce. Feeding a hive in early to mid October will have brood in the colony until late November. Beekeepers want the brood to shut down by late October. This will make Oxalic Acid treatments very effective. If brood is in the hive, the Oxalic Acid treatments lose their effectiveness. Also the last tidbit. 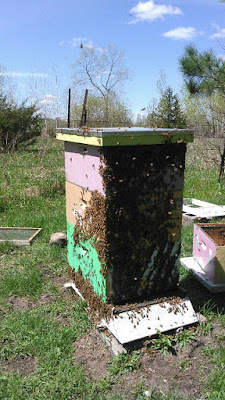 Never leave a partially filled deep or super on top of a hive that is being overwintered. If bees move up from below, into a full honey box that works great. But with a partially filled box on top, the bees may move up again into that box. Leaving the full box of honey below them. The bees will eat all the honey in that partially filled box. Then when the honey is gone, the bees starve even though there are still many frames of honey in the box below them. In winter, it is very unlikely that the bees will move down to get honey. I was out feeding bees this morning. I have fed once and I am feeding a second round. The feeder I am using is a hive top feeder. Hive top feeders work great for fall feeding. In the spring it can be too much syrup for a package of bees, but for fall feeding they work the best. My hive is a little out of level so I can't feed the full four gallons but two rounds of feeding give me the desired outcome. These are pics taken two weeks after a treatment of Mite Away Quick Strips on two colonies of Julie D's two hives. So the treatment of MAQS strips were on for seven days. That was her first pic two weeks ago. She removed the strips and cleaned off the screen bottom board slide. The new cleaned off slide was left on for two weeks post treatment. The mites you see still dropped off of bees or from the mites that had died in the cells and were removed by the bees. There were dead mites everywhere on her screen bottom board again. Julie started the year with two packages of bees. She did get some honey for her first year. I think this illustrates the importance of treating for mites. If you think you don't have them and you do, I call that beekeeper denial. Treat your bees NOW. It is starting to get late in the treatment window of time. Click on the pics for a bigger pic. Now that the honey flow is over for most of us, it is time to make sure the hive is set for winter. Mite treatments should be ongoing or completed by now. Honey has to be in the upper boxes. Bees will not move down for honey in the winter. Never leave a partially filled deep box or super on top of hive. If the bees move into this box they may consume the available honey and starve, even though there is honey in the box below. The top box on the hive should have 8 full frames of honey and one partially full frame. With the partial frame in the middle. The box below should have four frames of honey in it. Position the frames two on each side. There should be honey in the other frames that have brood in the hive. If you are in a three deep hive, in a perfect world, two frames of honey on the outside, one on each side. If your hive does not have that, you need to feed. Feed NOW. The bees should take feed very good right now. As the daily temperatures decrease, the bees may not take the feed down very well. That is why we need to feed hard. When we feed, it spurs brood production because it is a nectar flow and the queen will lay. The later you feed, the longer there will be brood in the hive. With brood in the hive, the bees will consume more food feeding and keeping the brood warm. This can effect their winter stores. Also mites will start increasing in the brood. Fall feeding is 2 parts sugar to one part water. The bees have to convert it to honey. That does take time. If you put in 24 lbs of sugar water, the bees have to dehumidify the sugar water to convert it to honey. So the net amount of syrup put into the hive will be several pounds lighter because of evaporated water. Nature's Nectar carries ProSweet syrup. ProSweet is similar to honey. The bees do not have to convert it to honey. The bees put it into the cells and they are done. If you put in twenty four pounds of ProSweet that is what is put into the hive. So feed hard. The bees will empty a pail in three days. 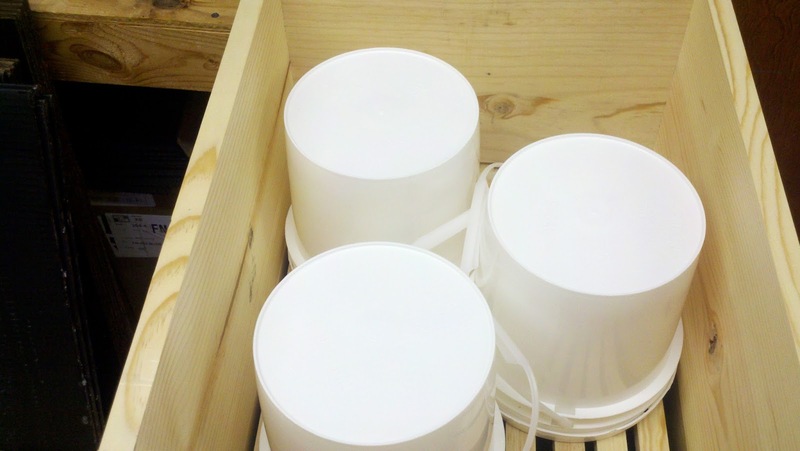 Three feeder pails can be placed directly on the top bars in the fall. A hive top feeder holds four gallons of syrup. The bees come up through the slots under the screen. Whatever level the syrup is, in the syrup well, the bees can pick up. When the bees are feeding, the entire screen area is solid bees. The honey flow is over for most of us. Mite treatments need to be put on ASAP. 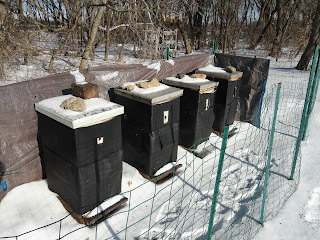 Treating for mites is imperative for hive winter survival. This pic is from a local beekeeper that treated for mites a week ago. She started the season with packages in new equipment. She did get a couple supers of honey, so for her first year she was very successful. She was concerned about winter survival of her bees so she treated for mites using Mite Away Quick Strips. Looking closely at the pic (double click on the pic for full screen) you can see the little maroon mites all over the sticky board. If there would have been no treatment, the mites would have increased with time. By early October the mite population would have exploded, the odds of overwintering would have been much lower. Waiting to treat the bees for mites? As time goes on, the mites will cause damage to the bees. The weakened bees are more stressed and winter survival can be threatened. A high mite load can cause late fall absconding. You look at your bees in early October and they look fine. Two weeks later you look again and there isn't a bee in the hive. This is a symptom of a high mite load. The other symptom of high mite load is the bees make it into February and look great. Then over the month the cluster decreases in size and the bees finally die, usually by late February. The bees are succumbing to a virus brought on by a high mite load. Treat your bees. By not treating, you are spreading mites to your neighbors hives. Be a good neighbor. After honey is extracted. The honey should be tested for water content. To be U.S. Grade A honey, the moisture content of the honey needs to be 18.6% water content or less. Honey that is over 18.6% will ferment over time. It is still safe to eat, but as time passes the honey can spoil. The water content is measured by an instrument called a refractometer. 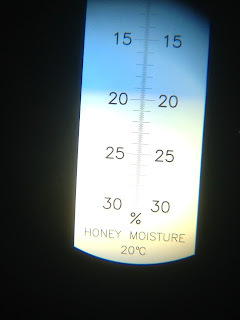 The refractometer takes a small sample of honey smeared on its lens. Then by looking through the eyepiece, a scale can be read in the instrument. This scale will tell what the moisture level of the honey sample is. There are many different refractometers out there. Refractometers are used in many different industries, measuring many types of liquids. 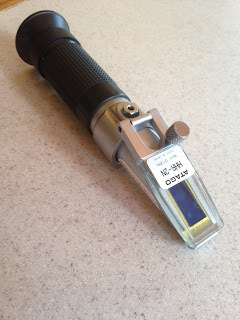 Beekeepers use a refractometer that is specifically for honey. We at Nature's Nectar LLC will test any honey for free. Bring us a sample. Refractometer, the plastic cover is lifted and honey is smeared on the purple lens. I've attached a document with some basic information about honey bees and beekeeping, including answers to many of the questions we're frequently asked. Read it if you're interested. You're not expected to memorize any of this. Your experience with beekeeping is all the information you'll need. If you have questions or need anything, email me at dschaaf@gmail.com or call during the fair at (651) 642-2307. Thanks again for supporting the Bee & Honey Show and the MN State Fair. See you soon! Governor Dayton makes a move to protect pollinators. The nectar flow for most of us is over. Some beekeepers are getting some late summer honey. It is very spotty. 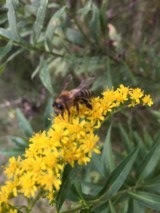 A few beekeepers are getting some Goldenrod nectar but they are the exception not the rule. Mite treatments are being put on hives right now. Bees emerging now, until brood rearing stops, are our winter bees. Winter bees live through the entire winter and are not replaced be any new bees. We want the winter bees as mite free as possible for increasing the odds of over-wintering success. The current cooler weather is appealing to beekeepers putting on Mite Away Quick Strips (MAQS). The vapors of MAQS are a little less intense when it is in the 70's and the product still works well. When the temps are in the low 80's for the first couple days, there can be some bee and brood mortality. It usually is not much of a problem. But if it gets too warm there is a possibility that a queen can get zapped. Other mite treatments are not as intense, but their treatment time take longer. ApiGuard is a one month treatment and ApiVar is a six week treatment. But the common theme here to get in your head (to the tune of it's all about the bass) It's all about the mites, bout the mites, bout the mites. Colonies not heavy with winter stores should be fed now. Don't wait to feed. Fall feeding is heavy syrup. 2:1 sugar water, 2 parts sugar to 1 part water. The other feed to use is ProSweet. ProSweet is just like honey. The bees take it down and put it in the cells and they are done. Sugar water the bees have to dehumidify it to convert it to honey. There is some work to do now with our colonies, September is a week away. It is stainless steel homemade extractor. It is operated with an AC motor. For it to operate the best, it could use a DC motor and a speed controller. If you are good with tools and understand how to put those items on, this extractor this may be for you. A speed controller costs around $1000. I am not sure about a DC motor. This larvae has a high Varroa count. The rest of the brood in this colony will be just as bad. Varroa weakens the bees immune system and will kill a colony. Beekeepers around the Midwest are treating their bees for Varroa mites. The time to treat for mites is over the next two weeks. If the treatments are put on a colony too late, the bees may not survive the winter. Bees that emerge from now until October are winter bees. Winter bees need to be as mite free as possible to be able to handle the rigors of our extreme winters. In the hive as time goes on, Varroa populations can increase dramatically. What starts as a relatively low population of mites in early August, can explode exponentially by late Sept or early October. Hives with high Varroa populations may look great in early October, but when the beekeeper comes back to wrap the colony for winter only to discover all the bees are gone. This is one symptom of Varroa. Late season absconding. Bees have around fifteen different viruses that lay dormant in their bodies. High mite loads cause these dormant viruses to come out. Bees are dramatically weakened by high mite loads and if the bees do not abscond in fall they will usually succumb to a virus in late winter. By doing a mite treatment now and following up with a mite treatment of Oxalic Acid in late October will greatly increase the health and survival of a colony of bees. Some beekeepers want to use Oxalic Acid all the time. Too many treatments of Oxalic Acid on bees can kill them. The pic above illustrates a high Varroa infestation in the brood cells. Oxalic Acid has no effect on mites in cells. That is why Oxalic Acid only works well in late October when there is no brood in the colony and all the mites are on the bees themselves. Mite treatments to use during August are Mite Away Quick Strips, ApiGuard, or ApiVar. I have a previous post a week or so ago explaining these mite treatments in detail. Beekeepers that don't treat their bees are part of the problem. Their bees have high mite loads and will infest their neighbors hive with their mites. Be a good neighbor and treat your colonies now. The daily temperatures after Wednesday in the upcoming week looks perfect for Mite Away Quick Strips (MAQS) treatments. 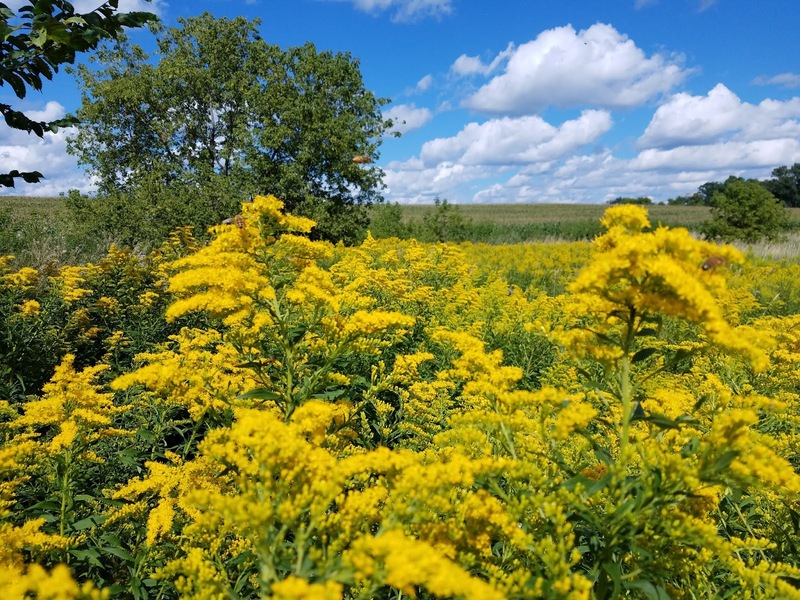 Goldenrod is blooming all over the metro area. 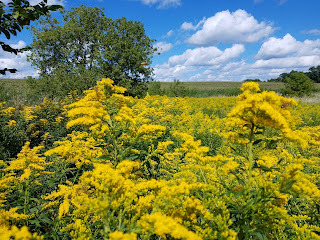 There are many varieties of Goldenrod. Prairie Restorations claim there are over 45 varieties in Minnesota. Only a few varieties form huge fields of flowers. Tall, Missouri, and Canada Varieties spread to form large colonies of flowers. The nectar flow off Goldenrod is very spotty and unpredictable. When Goldenrod nectar does flow, it can be a decent nectar flow and the bees can put up a super or two of nectar. You know you are getting Goldenrod nectar in your hive by standing next to your hive. If your hive stinks like wet sweat socks you know that the Goldenrod is producing nectar. The stink is only temporary. As the Goldenrod nectar ripens and turns to honey, the odor goes away. The honey does have a subtle but distinctive flavor. 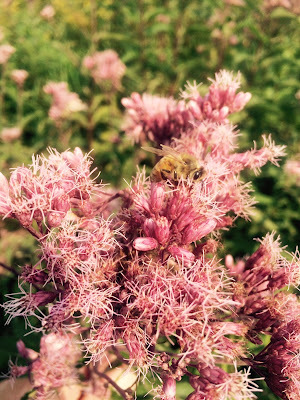 Goldenrod is one of the last large pollen sources for the bees of the season and they will pack the pollen away. Many of my customers have EpiPens. This is how the EpiPen makers make their money. Did you know Nature's Nectar LLC rents three frame hand crank extractors? $30.00 a day. 9 am - 8:30 am the next day. The extractor needs to be reserved, please call for availability. Honey can be pulled off the hive anytime now. The nectar flow has slowed in many areas. By mid August the nectar flow is over for most of us. Honey should be pulled and mite treatments should be applied. Any supers that are above the brood box is excess honey and can be removed and extracted by the beekeeper. Here is a couple videos on how to pull honey off the hive. We are overstocked on several items. We need the room and are having a sale. I have listed several mite treatments that are available for treatment of Varroa mites. Mite treatments should be put on the hive by Sept 1st. As time goes on Varroa builds up in a colony of bees. Failure to treat at the right time can cause your bees to become irreparably damaged by the mite and the hive more than likely will not survive the rigors of MN winters. Also failure to treat, causes your bees to infest other beekeepers colonies of bees. As bees in an untreated colony population crashes, bees from healthy colonies come to rob honey and get infested with mites from the untreated colony. Be a good neighbor and treat. I do not list Oxalic Acid here because that product works best in late October and not recommended for August treatments. Mite treatments cannot wait until October to treat. Waiting that long to treat will cause damage to the bees by Varroa. Treating with Oxalic Acid in August does not get to the mites in the cells. Repeated treatments of Oxalic Acid on the same bees in a colony can cause damage to the bees themselves. Our extracting workshop is full. 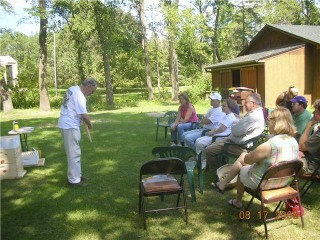 Beekeeper Steve Buck talks to a civilian about bees. That is the best part. Even a first year beekeeper knows more than the general public about bees. Don't be hesitant, it is fun. Please consider volunteering at the MN State Fair. This is the Minnesota Beekeepers crown jewel. 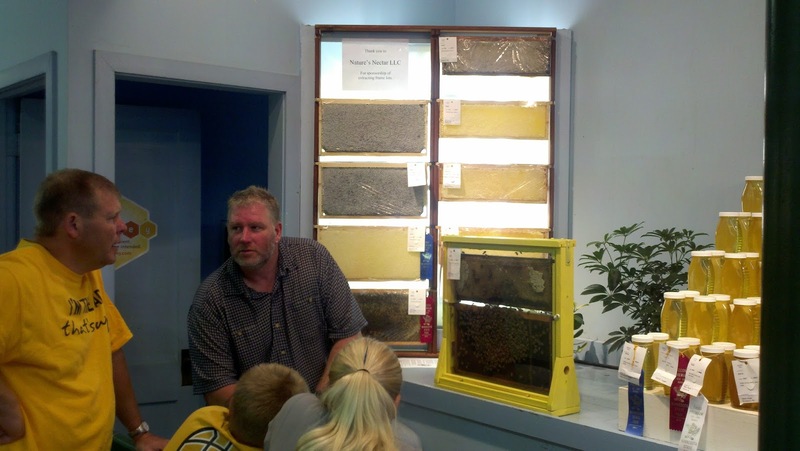 Beekeepers can show off their industry. The large number of fair goers coming through the Bee display is astounding. Positive public awareness leads to public support for protecting all pollinators. The fair staff can really use some help on setup and bee interpreters. I can't state enough how positive this experience this is. Wendy and I have volunteered at the fair for over twenty years. It is something we look forward to and it is always a great time. On the sign up page on the link below, click the link. Click on the sign up box in the date and time slot you want and the box will have a green check mark in the box. At the bottom of the page there is a black box that says submit and sign up. Click that and that takes you to the sign up page. Fill out the highlighted boxes. Under comments I just wrote our names. It is required to write something, some folks wrote their initials. Dave needs your address, if you sign up before the 15th he will send you a free ticket to get into the fair. Wendy and I signed up twice so Dave is sending us to the fair for free. * Volunteers especially needed Labor Day weekend, Sept 2 - 5. This are the busiest days of fair, with more people looking at our exhibits and asking questions than any other time. It's your last chance to have this much fun until 2017! * Lots of help still needed pre-fair, as we're getting everything ready for opening day. We're having a cleaning party this Saturday, Aug 13, from 9am until 1pm. Also need many helpers Aug 22 - 24, the last three days before the fair opens. * If you'd like to get a State Fair admission ticket in the mail, you need to register by Monday Aug 15. That's when I print the list and assemble volunteer packets. You can still sign up after that date, but I won't be able to mail you a ticket. Thank you for supporting the Bee & Honey Show. See you at the fair! We will be having our annual extracting workshop again this year. It is limited to 40 beekeepers. If you have been to this workshop before no repeats. Please give a newbee a chance. 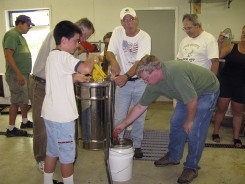 What: We will be demonstrating how to pull honey, methods of extracting honey, bottling honey, how to winter your bees. This is a hands on work shop. You are expected to get a little sticky. Please RSVP by phone or email. Limited to 40 beekeepers. Please no small children. This is a video of three frame extractors, hand crank or motorized. Nature's Nectar LLC sells these extractors. We do rent the hand crank three frame for $30.00 a day. This is a video of a 9 - 18 frame radial extractor. This is one of the style extractors that Nature's Nectar LLC sells. 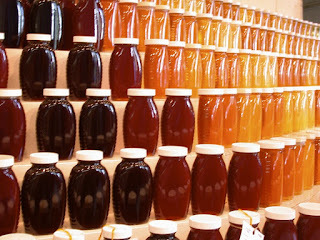 Honey on display at the MN State Fair. 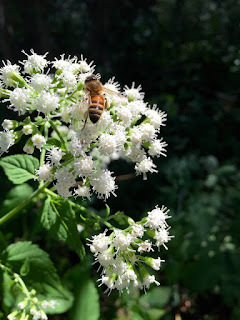 The black honey is Buckwheat honey and is considered Amber in color, The reddish colored honey is Light Amber in color. The lighter colored honey in the rest of the photo is considered White honey. The great Minnesota get together is coming in a few weeks. Beekeepers have a wonderful opportunity to show your honey to the state of Minnesota. Entering honey in the fair competition is fun and all your fiends and family will go to the honey display to look at your honey. There are two classes to enter in many honey categories novice and open class. The honey booth is a huge draw for the general public and beekeepers can promote the beekeeping industry by participating by entering some honey. Read the Premium book about the different classes to enter. If you have never won a ribbon you can enter the novice class. If you have won a ribbon, the open class is for you. Follow the directions in the class you are entering. You need to register by 4:30 pm August 15th. It is best to have your honey bottled several days before the entry is to be delivered to the fair. Nature's Nectar LLC carries all the bottles for the fair and can offer tips on how your entry should look. Did I mention that you can win some prize money? If you win a ribbon, you can say that your award winning honey is the best in the State of MN. The nectar flow has been decreasing in intensity. Many summer flower are going away. New late summer flowers are coming online. 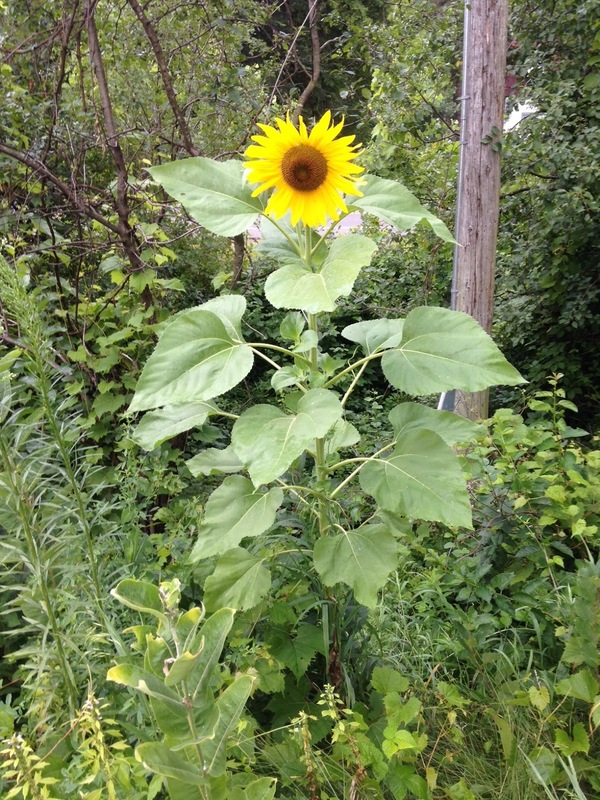 Goldenrod, Purple Loosestrife, Joe Pye weed, Sunflower, and Alfalfa will start blooming again. At this stage of the nectar flow I usually look at my supers and I hold off on putting more supers on. Letting the bees fill up partially filled supers before adding more supers. If the supers are 3/4 full, I will add one super at that time. White Snake Root toxic to cows, goats, sheep, humans. Don't know how the nectar is. The bees love it. This article talks about research on honeybees in South Dakota and the levels of neonicotinoids. Neonic's are a pesticide applied to seeds of many plants such as corn and soybeans. Paul from Warner Nature Center shared this hive scale photo. The yellow line is the honey weight. 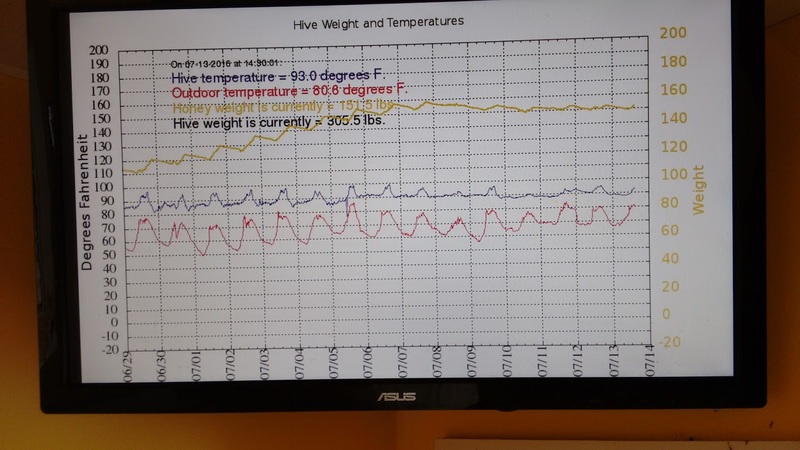 You can see the hive weight increased from about 110 lbs on 6/29 to around 150 lbs on 7/7. Notice the rise and fall of the hive weight everyday. As the bees bring in nectar, the bees fan the hive to evaporate water in the nectar. The weight of the hive changes daily until the supers are filled out. The weight then stays pretty much constant after that. Maybe falling slightly. Paul explains that it was not for a lack of nectar flow. The supers were all full and the bees stopped collecting. He was aware of the supers being full. FYI: We have installed air conditioning in our sales room. How does the hot weather affect the bees? When it gets really hot, the bees will hang out on the front of the hive. This is normal. Inside the hive it is packed with bees. Bees are hanging on and covering the frames. With the large population of bees it is hard to cool the hive. To compensate for the heat, collection of water increases. Water is placed throughout the hive and the bees will fan their wings to create air currents. The air currents evaporate the water and have a cooling effect similar to a swamp cooler that are used in the drier western states for air conditioning. The weather that is coming has high heat and humidity. The high humidity make evaporating the water in the hive more difficult and the cooling effect from evaporating the water is not as great. 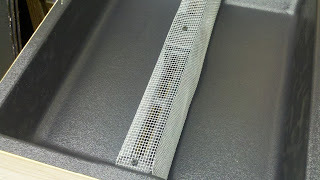 So to help cool the hive, bees will move out of the hive to reduce crowding on the frames. The bees can cover the front of the hive, cluster under the front of the bottom board, and/or cluster underneath the front edge of the telescoping cover. Taking measures like lifting covers can make cooling the hive harder. Bees set up air currents in the hive by fanning. Creating a large opening may make it harder for the bees to cool the hive. When the temperatures cool of the bees will move back inside. My wife and I went for a walk down the Browns Creek Trail in Stillwater this morning. We went a few miles, beautiful morning for a walk. Breezy plus no bugs. We were looking at all the flowers blooming. Many summer flowers in full bloom or some coming on strong in early stages of bloom. Take Manning Ave to McKusick Road. head east to Neal Ave. Take Neal Ave South about one block. There is a large parking area there and a Stillwater park with a big kid play structure. We got on the trail and headed west. It is about a mile to the Manning Ave Bridge. I am being descriptive because they are working on a new subdivision of 55 homes. At that point it is a perfect place if you have any tykes that like trucks and big equipment to safely view the construction from an elevated viewpoint. But I did take some pics of what is blooming that was my true focus, not the loss of pollinator habitat. At the MN Hobby beekeepers on Tuesday night. An hour before the meeting two U of MN scientists Gary and Mike go thru colonies and explain what is going on. They answered questions and demonstrated mite testing. The over wintered colonies they tested all had high mite counts. 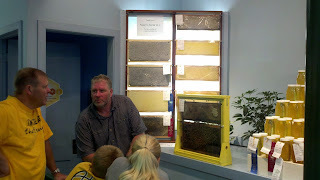 This is a wonderful opportunity to learn about what is happening in a bee hive.